With dozens of product lines to choose from, browsing may take some time (unless you already have a good idea of what you want in a faucet). You can filter the GROHE faucets, parts, and accessories in the product result to match your purchasing needs. Filter for mounting configurations, design features, and more. Consider all the various features and decide what you want to pay for. Pullout spray features, for instance, are very convenient for users and we recommend that all kitchen sinks be equipped with this capability. 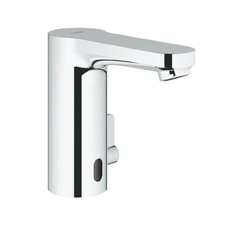 Some of our most popular GROHE items are parts. We have a great price on this hard to find replacement pull out spray, the GROHE 46173SD0, as well as the Grohe 46573DC0 K4 Spray Head. 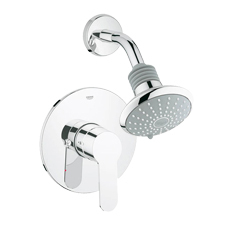 Whether you are looking for GROHE bath faucets, showerheads, or a shower valve, we have the part you need. Trim kits, faucets, and fixtures purchased from the same manufacturer allow you to match both style and finish in your bathroom. If you need replacement parts, like handles or trim, PlumbersStock has thousands of GROHE parts for replacement purposes. 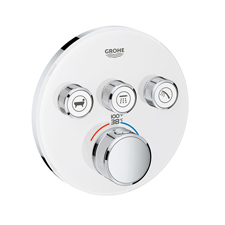 We also carry a wide array of accessories, like GROHE soap dispensers, dishes (for lavatory sink and bathtub), towel rings, toilet paper holders, and more. 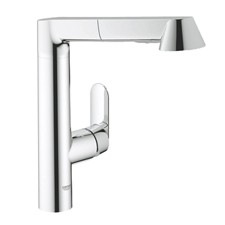 For some of the most beautiful lavatory faucets available, many professionals and homeowners choose GROHE. 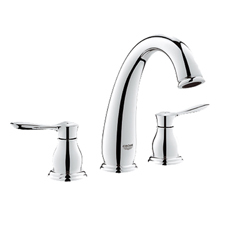 Faucets are meant to last, and if you plan on living in your home a while, GROHE is an excellent choice because, with their ageless and unique styles, you will not tire of your selected fixture. 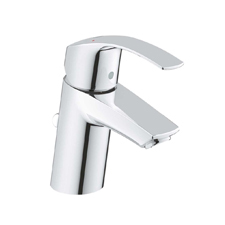 For lavatories, we recommend that you select a single-handle faucet for convenience. You may be going for an antiqued look, and two-handle is a great option to consider in that regard, but one-handle configurations allow you to quickly set a comfortable water temperature with one hand. 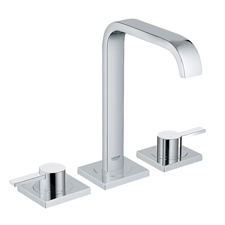 Honestly, you cannot go wrong, no matter which GROHE bathroom faucet you select. One of the most decorated manufacturers in the business, GROHE is the recipient of well over a dozen Red Dot awards. It is clear that their business model is centered around creating beautiful and long-lasting products. You may pay a little more for GROHE fixtures, but as the saying goes, in general, you get what you pay for, and with that in mind, GROHE faucets, parts, and accessories are bargains, especially when you take advantage of PlumbersStock's low prices. With a focus on economical water and energy usage, GROHE fixtures simultaneously deliver comfort and convenience. 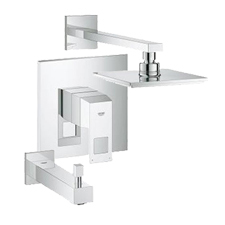 If you are having any trouble locating the best GROHE parts for your kitchen fixtures and bathroom needs, please contact our staff and they can help you get on the right track. With a convenient shopping experience and the lowest prices you will find on the web, PlumbersStock is your best option for online plumbing supply. Thank you for choosing us. Learn more at GROHE.com.